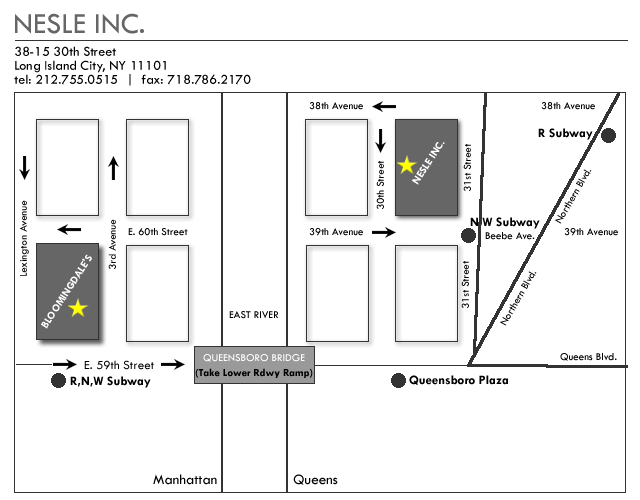 -Take 59th Street to Queensboro Bridge (Lower Level). -Go Straight to Northern Blvd. Turn Left on Northern Blvd. -At Second Light (41st. Avenue) Turn Left. -Turn Left on 30th St. We are located on left side (Next to Fisher Landau Center for Art). -N, W Trains - Take 2 Stops to BeeBe Ave. / 39th Ave.
-R Train - Take 2 Stops to 36th Ave. Copyrights © 2006 Nesle Inc. All Rights Reserved.